This is the ProTek R/C Electronic Switch. 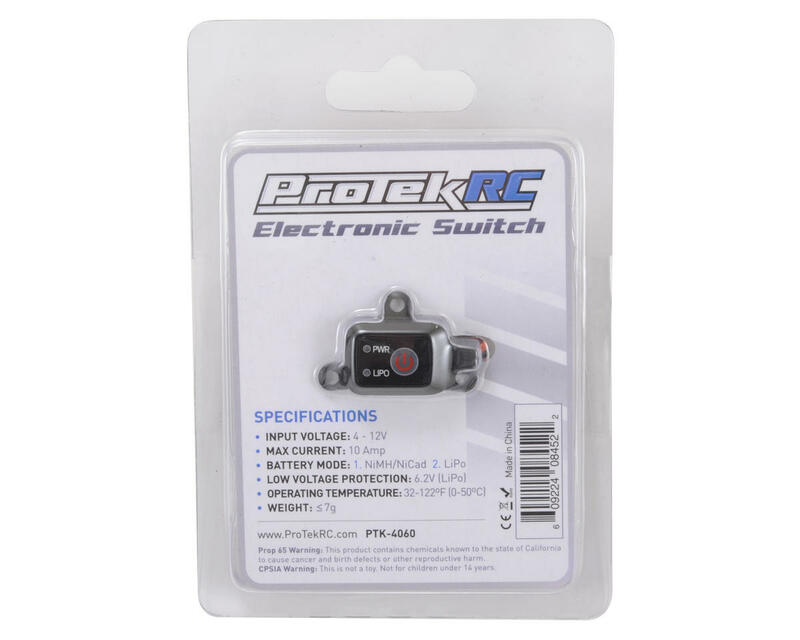 The ProTek R/C Electronic Switch is a lightweight and compact MCU controlled digital ON/OFF switch for your radio controlled model. With the push of a button this digital electronic switch eliminates the problems with intermittent contact associated with mechanical switches. This ProTek R/C Electronic Switch can be easily mounted to the transponder mount of your model or any other suitable location using double-sided tape (optional bottom covers are included). 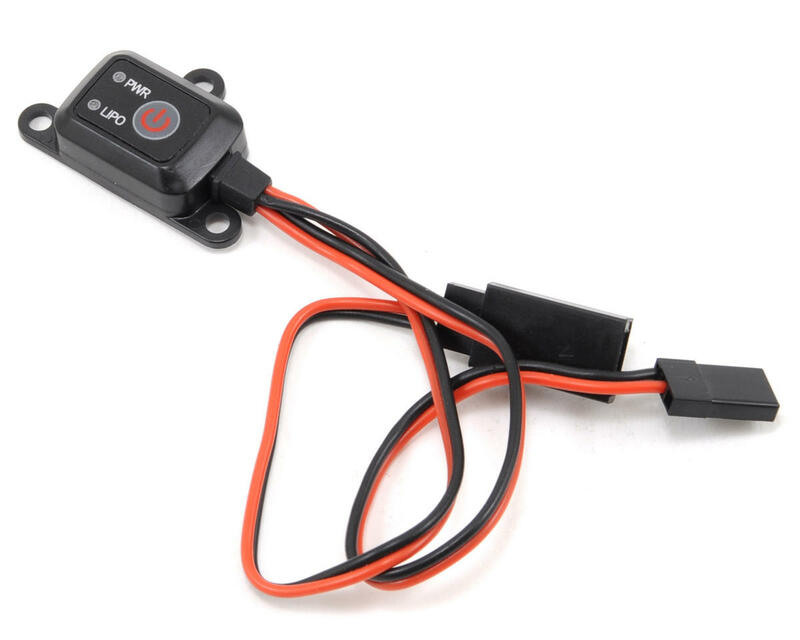 The ProTek R/C Electronic Switch includes a LiPo mode that when selected, will auto-detect low LiPo voltage and will cut-off power from your LiPo battery to prevent over discharging. LiPo mode can be turned off if other safeguards are in place or you are using a NiMH or NiCd battery. The ProTek R/C Electronic Switch also monitors the remaining capacity and condition of the battery pack, and indicates the status with the use of LED's. Ok I tried it ! Maybe it's just me or the choices I have made with switches ( on and off buttons ) on ALL of my RC's ! This one didn't last a day of practice ! Running this in a Losi 3.0 with Dyn lipo ! All of a sudden just cutt off - fully charged lipo - all connections brand new. There is NO WAY to run a product that you do not have the confidence in, when you are using when it comes time for the Amain event ! I do not recommend this product or endorse this product! No way to say it was a bad batch because when you buy something you expect it to work flawlessly the first time with out having to work out the BUGS or batch number supplied with it ! Again a day or practice and didn't last ! I do not recommend this product ! Not looking for a refund or store credit - just a product I can rely on ! This is an excellent switch. When I first held it in my hand I was not all that impressed for the price, but now that I have it installed I really like it. It's great to be able to see the charge of the lipo receiver battery at a glance and its much smoother to operate than a mechanical switch. I mounted mine to the transponder mount. I used two layers of foam tape underneath and screwed it down but not all the way to accommodate the tape (leaving 1-2mm). Hopefully the cushion will make this thing last! One star off for value - as good as it is, this switch ain't worth $40. I just finished my NT48.3 build and had to have one quick so I couldn't wait for them to go on sale, but if you are not in a hurry you should shop around. These things can't be much more than a few bucks to make and their mark up is unreal. This switch is awesome!It has a lipo cut off. Plus it even shows you how much power is left in the battery! Super compact as well. Works like a charm. No issues in many years of abuse. 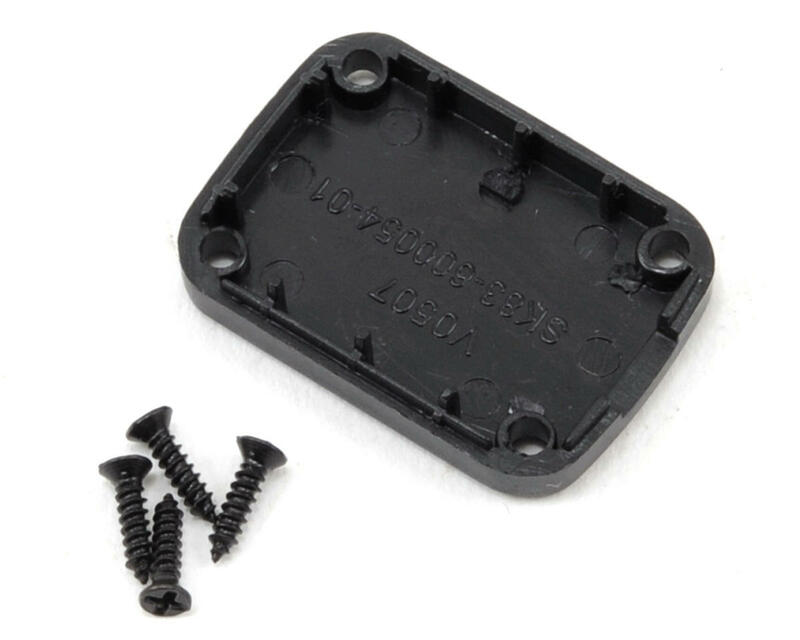 Long leads allow mounting in numerous areas of your battery box or chassis. a great product 4 others at my local track also have this switch and love it great product! I ran this switch for a month or so then I went out to the track for a race and as soon as i pushed the button the switch smoked and burned a hole in it. It burned up a brand new protek battery and r304 receiver along with it because when it smoked the switch would not activate on or off so it burned until i could get battery unplugged and amain told me to call the hobbyshop i got it from when they should back the product up. AVOID LIKE THE PLAGUE!!!! Has worked very well for me so far. I've had it for about 4 months. Update: 4/21/16. Switch still works on my nitro buggy and truggy, but noticed case is cracking. I had to ca the switch on the truggy. I have one layer of parma gel tape under it. I may go with two layers. Update 9/6/16. The two layers of parma type tape seems to work.